Romantic secluded one bedroom cottage tucked into acrers of forest land. Located in the hub of Northwest Washington State, Samish Point by the Bay is central to all the area attractions. Visit our web site to view the 'Five Fabulous Day Trips' that highlight this beautiful region. Samish Island, part of the San Juan Archipelago, was connected to the mainland in the 1950's. Quiet, private, casual, the island offers a peaceful retreat for those who inhabit it's beautiful terrain. Our 'Little House in the Park' is nestled in a serene setting among giant cedar, fir, and big leaf maple trees that stand grandly on 40 waterfront acres meandering across high wooded bluffs that drop majestically to sandy beaches and rocky coves. The gracious gardens include a mature orchard of pears, plums, apples and cherries, perennial beds, sweeping lawns and woodlands that frame the expansive views of Samish Bay. An extensive private trail system leads through meadows, forested walks, and to the drift wood beach below for hours of beach combing. 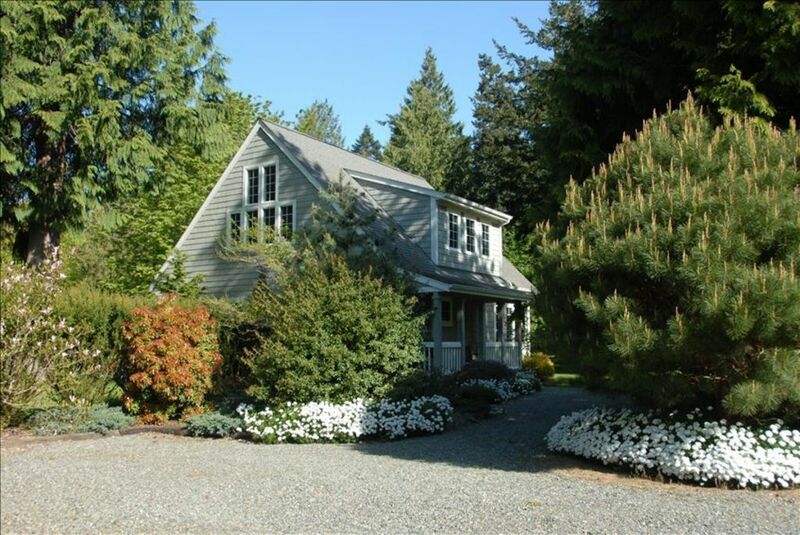 Only two houses, Samish Point Cottage and your host home located on the other side of the property, share this private estate. Styled after the Cape Cod homes of the 1940's our 'Little House' unto itself, connects to nature with views of a vast sweeping garden and wild native woodlands. Bird life abounds with daily sightings of soaring bald eagles and the great Blue Heron. Artfully designed the River Rock fireplace commands the cozy living room and adjacent dinette with full kitchen. The kitchen pantry is well stock with all the basics for cooking in, or try one of the nearby restaurants offering choices from casual pub-grub to haute cuisine with award winning wine cellars. For your convenience Starbucks coffee, tea, cream and sugar are provided for two mornings of your stay. The king bedroom has it's own ensuite bathroom and king sized bed on the main floor. For those who seek a secluded, restful retreat from the hustle and bustle of daily life, Samish Point Cottage will suit you every need. Starbucks coffee, tea, cream and sugar for two mornings of your stay. Vast sweepimg gardens, meandering meadow and wild native woodland views. Miles of forest walks and trails to the beach and western sunsets. Bird watching extrodinaire! My family members loved the home. Each bedroom has their own bathroom so privacy is easy. The setting is beautiful. Nestled in a park-like setting with towering cedars and complimentary landscaping, this cottage is nicely appointed with everything you need to have a quiet and private get away. We like it so much that we have already booked another stay here. Thank you for the thoughtful review. It is a joy to share such a peaceful experience. Anne … I am humbled by your most generous review and look forward to hosting all those who will be moved by your script in this review. Our philosophy is to highlight the country life of peace, tranquility, and the simple joy of connecting with the flora and fauna of the Great Northwest. Everything to make staying comfortable. Lovely house and grounds. Very recommended! Samish Point Cottage was so comfortable we wished we could have stayed much longer! Super clean, very well equipped throughout and a beautiful private location. Theresa's website has suggested day trips listed and the 3 we took didn't disappoint. We highly recommend this vacation destination. My sisters and I, three of us, rented this home for twelve days. We each had our own spacious room and bathroom which allowed us to go to bed when we wanted, sleep soundly and get ready for the day at our leisure. (FYI: The rental price only includes one bedroom, not all three. You need to specify if you want more than one bedroom.) The home is beautiful, clean and the grounds were well maintained. The porch lights are on a timer, so when we arrived home after dark in the evenings, we were able to find our way easily to the front door. We enjoyed cooking and eating some of our meals here, the serenity and privacy that surrounds the cottage, and doing some hiking, which you must do if you want to see the bay. (The hike down to the beach is steep and there are drop offs.) You cannot see any water from the house itself, but you do as you drive into the point and out from the point. The views are spectacular! We did laundry when needed, watched movies and savored every moment we spent here. I felt the only drawback, if you consider it a drawback, was the fact that I could not get cell phone reception. (My sisters could, so I guess it depends on your carrier.) Theresa was a wonderful hostess and was gracious to give us a tour of the flora and fauna around her home. We were able to do several of the day trips suggested and enjoyed the outings very much. It is quite a drive from the point into some of the surrounding towns, so if you are not one to enjoy driving back and forth, then you may want something closer to town. If however, you are looking for tranquility, privacy, beauty and a special place to call home for a few days, this is the perfect get-away. Samish Point House by the Bay is a little slice of heaven! You won't be disappointed!